Visit a Thai restaurant in the US and you’re likely to see yellow curries and pad prik khing next to drunken noodles and pad thai. Fine dishes in their own right, but many of Thailand’s best recipes actually come from in and around the northern city of Chiang Mai. 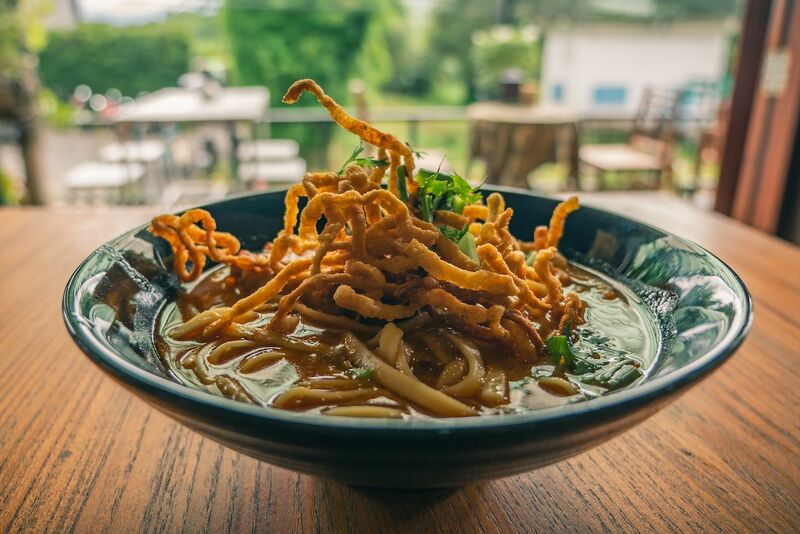 Northern Thai recipes aren’t as well traveled as their southern counterparts, often making it tougher to enjoy a hearty bowl of khao soi the further you are from the area. Which makes a visit to the region all the more worth it for the culinary inclined. Meals in Chiang Mai are cheap, and quality street vendors are as plentiful as the vibrant cafes and restaurants that line the fortified city center. The modern city extends far beyond the original enclosed space, so do yourself a favor and venture out when seeking these seven dishes. Your taste buds will thank you. 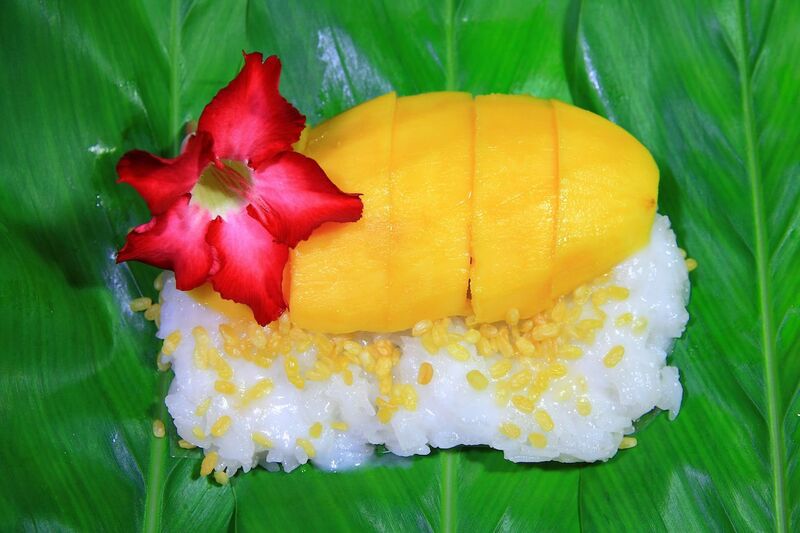 You’ll be laughed at if you tell someone you’ve been to Chiang Mai but haven’t tried mango and sticky rice (khao niaw). 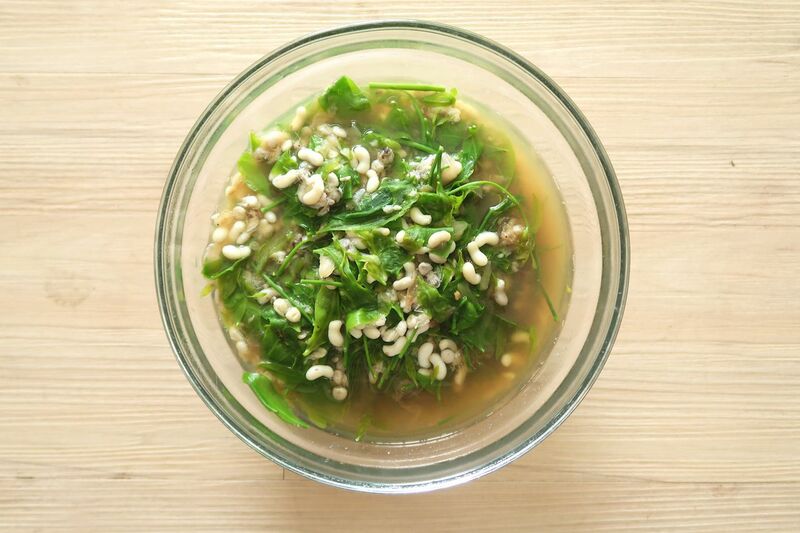 Northern Thais call their cuisine isaan or lanna, terms that have lived on since the Kingdom of Lan Na ruled the region from the 13th to the 17th century. Chiang Mai was established in 1296 to serve as the kingdom’s capital, and today, the city is both the cultural hub of northern Thailand and a popular backpacking stop for travelers trekking through Southeast Asia. Sticky rice is the culinary staple of northern Thailand, a unique grain that’s heavy on gluten and low on amylose. On its own, the taste is quite bland to western palates, but when paired with the sweet and dominating flavor of mango or a heavy grilled protein, you have a street dish that fills you and a partner up with just one order. The best place to try sticky rice is at Chiang Mai’s famous night bazaar, which happens nightly at the intersection of Tha Pae and Chang Klan roads. Khao soi might just be the greatest thing ever put into a bowl. The dish consists of thin rice noodles with braised chicken served in a spicy coconut curry broth, and the whole thing isn’t shy on shallots and garlic. The broth is kicked up with shrimp paste and topped with a garnish of fried wonton noodles, cilantro, and lime juice, with some places opting to add shrimp and/or pickled veggies into the mix. Khao soi resembles southern curry dishes in a few key ways, like its creaminess and the option to swap chicken for pork or go vegetarian, making this a great way to introduce yourself to northern Thai cuisine. The dish is popular across northern Thailand, as well as neighboring Myanmar and Laos. 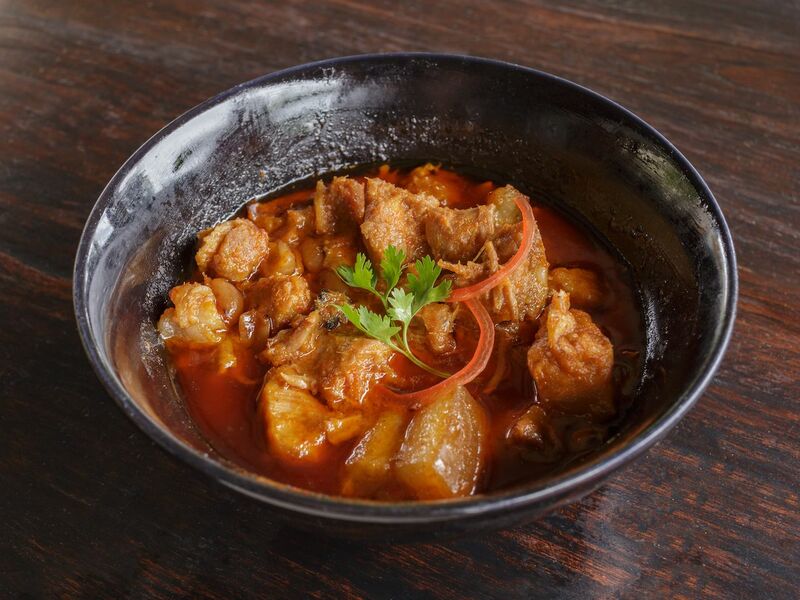 The rich pork curry known as kaeng hang lei is a common meal served in cafes across Chiang Mai and the northern province. It’s heavy on garlic, turmeric, ginger, and tamarind, making it vaguely reminiscent of the curries of Myanmar and India. The dish is less spicy than most in northern Thailand though those unaccustomed to hot foods will definitely notice a kick. 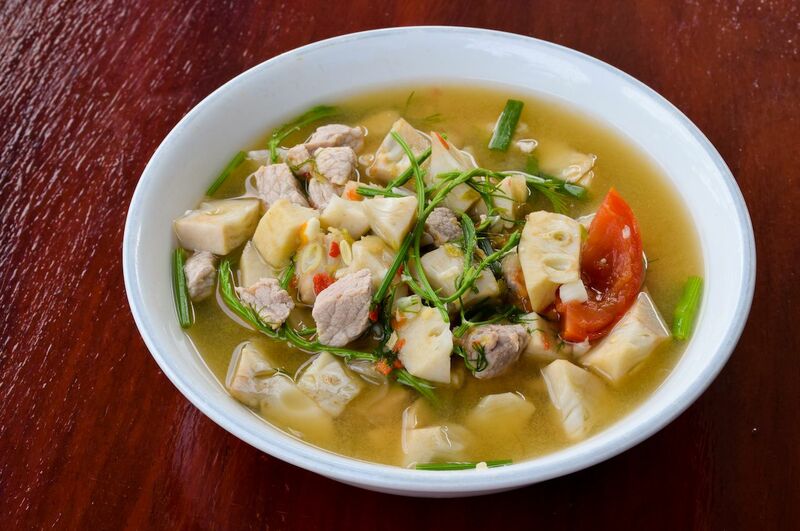 Kaeng kanung is a curry dish made from unripe jackfruit and cherry tomatoes. Jackfruit is one of the most versatile veggie substitutes for meat in many Asian dishes, though kaeng kanung is typically also served with pork (though you can find places that serve the dish sans-meat). The sourness of kaeng kanung makes it somewhat similar to khao soi. If you’re traveling with someone who’s insect-averse, maybe don’t tell them that those little white bean-looking things in the soup appetizer you ordered are ant eggs. At least not until after dinner. Ant egg tom yum is served in certain restaurants across Chiang Mai frequented by Thais and travelers accustomed to the culinary styles of the region. The soup’s flavor is dominated by the broth and cooked vegetables in the soup. You’ll hardly taste the red weaver ants, though they may pop in your mouth similar to the way fine caviar does. Red ants are commonly served atop salads in northern Thailand, as well, and they’re renowned for their medicinal benefits. 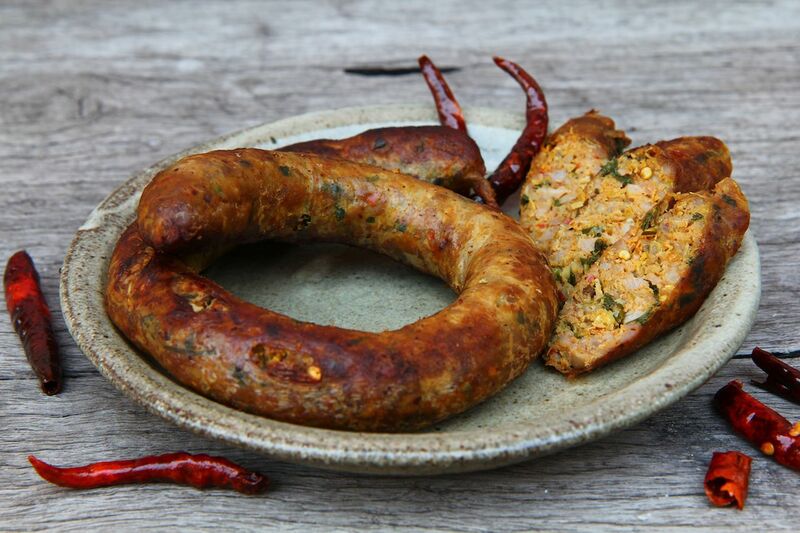 Cook pork sausage with chilies, galangal, lemongrass, and lime leaves and you have sai qua, which translates to stuffed intestine and is commonly known by westerners as Chiang Mai sausage. Sai qua is salty and spiced with red curry paste, and it’s a common street food served by vendors in Chiang Mai and throughout northern Thailand. The sausage is typically accompanied by sticky rice or veggies. 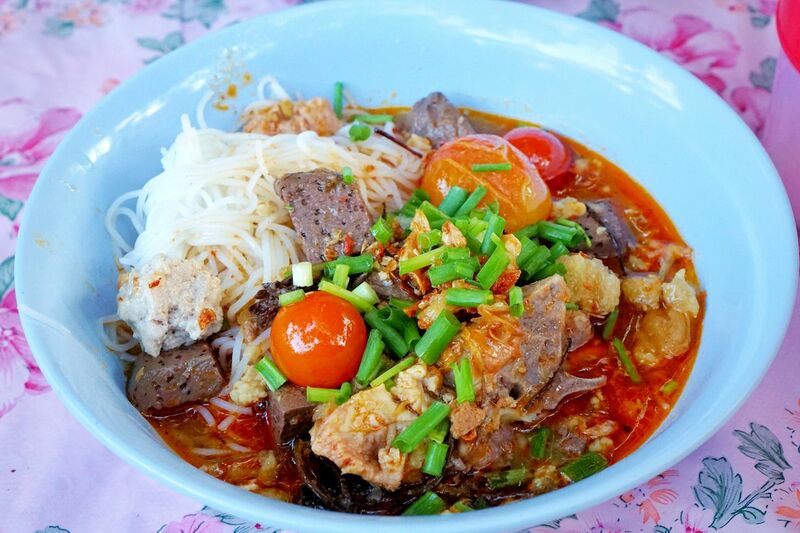 Khanom jeen nam ngiao is northern Thailand’s take on tomato curry. Anchored by shrimp paste, lemongrass, and dried chilies, the dish is served with rice noodles and spicy pork balls. The broth itself is a staple northern Thai delicacy, but add in a serving of coagulated pig blood and pickled cabbage, bean sprouts, and fried pork skin, and it takes on a flavor all its own.